I am not a fan of the New England Patriots. I'm a hater. However, I respect the hell out of them. They win like no one in NFL history. Have to respect a winner. Especially in today's age of free agency and parody. Somehow they continue to make it to the Super Bowl. I'm not really a fan of the New England IPA. At least the super-cloudy New England IPA's. I don't mind hop haze, but if the beer looks like yeast soup, I just don't think it looks very good or tastes very good. It drives me crazy when I see one of those thick looking yeast bombs on Instagram and people comment how pretty it looks. To me it looks horrible. Anyway, in the winter of 2018 ... after the Patriots lost LII, I decided to make a beer "in honor" of my hatred. I used some of the water treatment suggestions I've seen online for NE style IPA's. 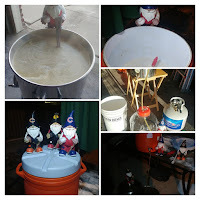 I also am experimenting with a shorter-than-usual boil, which I figure should add to haze. If I remember, I'll add the dry-hops before fermentation ends. I'll be keging and drinking this pretty young. We'll see if all that makes a hazy pale ale. Salts into the strike water to bring up Calcium and help with clarity. Short mash. Entire volume of water in the mash (no sparge). If volume low, add water. Boil 30 minutes, adding hops and yeast nutrient as directed. Cool as close to 60 degrees as possible. Pitch hydrated yeast. Ferment first day 60 to 64 degrees. Let raise as it wants after first day. After a couple of days, add dry hops to the active fermentation and leave for 5 days. Day 1: Rocking and rolling. Brewed Sunday. Yeast was rocking and rolling next day. Tried a sample this evening. Gravity is around 1.016. Flavor is really good. The beer is hazy to style. Shook the keg to force-carbonate some. Beautiful haze. Delicious hop flavor. Seems to be a success. Moved to kegerator. Tasting great. More of a traditional session ipa than a NE Pale. But that is fine. Really clear now. Good hop flavor still. I think this beer is almost gone.